This calculator will show you how adding just a few dollars a day to your loan payment can pay off big time -- in both time and money. Plus the calculator includes an optional, printer friendly, revised payment schedule that you can print out and use to track the repayment of the loan. Enter the dollar amount you still owe on your loan (without the dollar sign). Note that the amount cannot be arrived at simply by multiplying the payment amount by the number of payments remaining. Call your lender if unsure of the amount. Enter the interest rate expressed as a percentage, but without the percent sign (for 6.5%, enter 6.5). Enter the current monthly payment amount without the dollar sign. Enter the additional amount you could pay each month. If you would like the results to include the revised amortization schedule, slide the button to the "Yes" position and then select the starting month and enter the starting 4 digit year in the line below this one. If you chose to include a revised amortization schedule, select the starting month and enter the starting 4 digit year. This is how much interest you will pay if you just continue to make your current monthly payment. This is how much interest you will pay if you continue to add the extra payment amount until the loan is paid off. This is how much interest you will save by adding the extra payment amount each month until the loan is paid off. This is how many payments you have left if you continue making your currently monthly payment amount. This is how many payments you have left if you add the extra monthly payment amount each month until the loan is paid off. This is how many monthly payments earlier you will pay off the loan if you continue to add the extra monthly payment amount until the loan is paid off. This is the estimated month and year your loan will be paid off if you just continue to make the original payment without adding any monthly extra. This is the estimated month and year your loan will be paid off if you add the monthly extra to your existing loan payment. 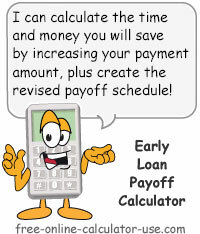 This early loan payoff calculator will help you to quickly calculate the time and interest savings (the "pay off") you will reap by adding extra payments to your existing monthly payment. The calculator also includes an optional amortization schedule based on the new monthly payment amount, which also has a printer friendly report that you can print out and use to track your loan balance. Note that if you want to make weekly, one-time, or annual lump sum extra payments, please use the Extra Payment Mortgage Calculator, which also works for installment loans. If you want some incentive for adding payoff amounts to your existing loan payments, picture yourself having the choice between handing an amount of cash over to an already-wealthy creditor, versus providing a genuine need for a loved one. Your family needs your money a lot more than your creditors do, so I urge to stop helping creditors to become richer at the expense of your family's financial well-being. Take a stand for your family -- instead of for your creditors -- by working hard to pay off your loans ahead of schedule. That way you can use the interest savings for more meaningful purposes than just helping the rich get richer. Enter the loan's current balance. Enter the extra amount you can afford to add to your current monthly loan payment. If you would like the amortization schedule to be included in the results, move the slider to "Yes" and select the month and enter the year you want the schedule to start at. Click the "Calculate Payoff Savings" button. If you chose to include the amortization schedule in the results and would like to open a printer friendly report for printing, scroll to the bottom of the schedule and click the "Printer Friendly Schedule" button. This will open the report in its own window for printing. The annual percentage rate the lender charges for borrowing the money. Each month the lender multiplies the principal balance owed by 1/12th of the annual percentage rate. This amount is then deducted from the payment amount. The amount remaining after the interest charge is deducted is the amount of your payment that will be used to reduce the principal amount owed. The amount of time the repayment will last. The longer the term, given the same interest rate and principal, the more interest you will pay. The amount you will need to pay each month in order to pay off the loan by the end of the agreed upon term. A portion of each payment is deducted for the lender's money rental fee (interest portion), and the remainder (principal portion) will be used to reduced the amount you owe. Otherwise referred to as "P&I" payment.